We were out in Bromley one Sunday and I decided we should do an improptu review. 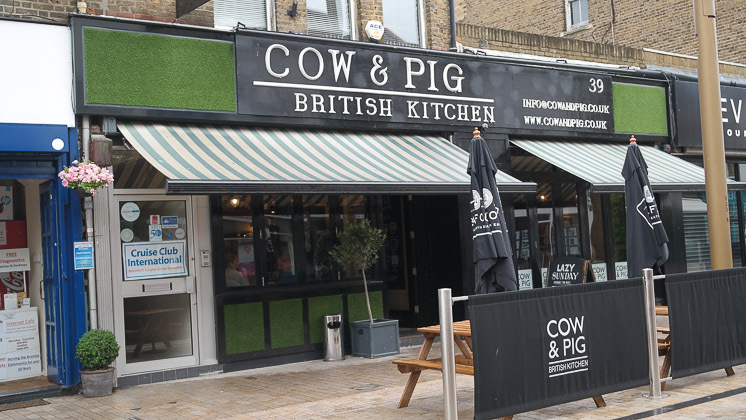 With this in mind, I remembered that there was a (newish) restaurant called Cow and Pig in East Street (the “eating quarter” of Bromley). We were met at the door and shown to table. The cow hide styled chairs were comfortable and the table was laid out. There was wood on the walls, along with fake grass. Music was playing in the background, over speakers. The venue seemed smart but fun. A lime and soda for me and a glass of processco for Claire. We decided to go straight to the main course – ordering steak and chips from the kids menu for JW (our gluten, wheat and dairy free toddler) and a roast sirloin on beef for me, Claire asked for the roast chicken. We also ordered some extra cauliflower cheese and stuffing balls – £3 each. Food came out within 25 mins and consisted of 3 large slices of pink beef, 3 roast potatoes with skin on, a Yorkshire pudding and gravy. Claire had a chicken supreme (a breast with the bone on). 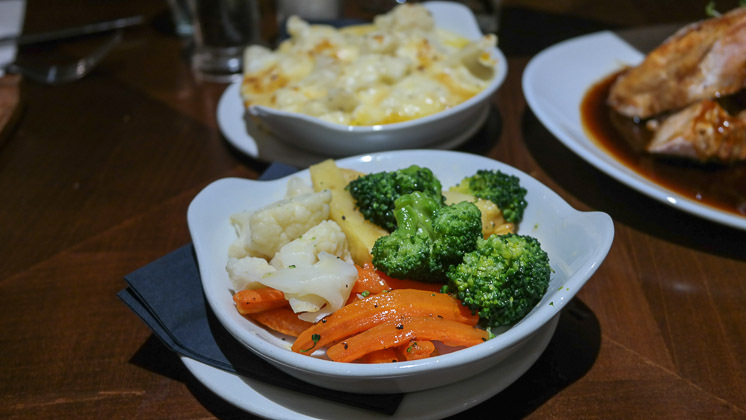 We had buttered carrots, broccoli, cauliflower and parsnip in a dish, and the cauliflower cheese was served separately. 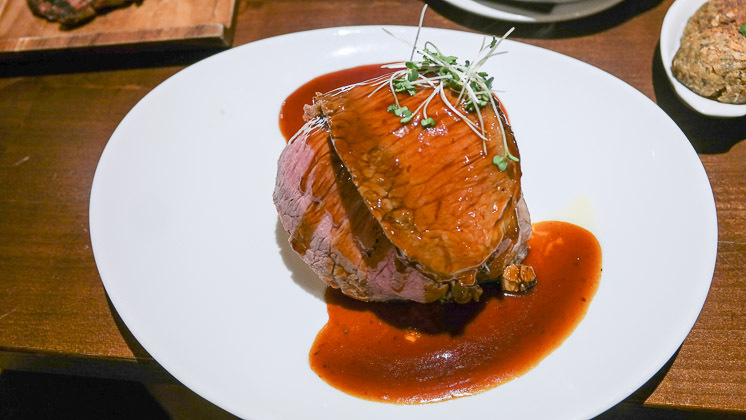 Tucking in, the food was very good – excellent roast sirloin of beef, very tender. The roast potatoes were actually good, even though they had their skin on (normally, I find they need to be completely peeled). The vegetables were nice, I especially liked the sweet carrots. The cauliflower cheese was delicious, being creamy, rich and very cheesy indeed! Lastly, the gravy was very rich and added lost of moisture and flavour to the meal. 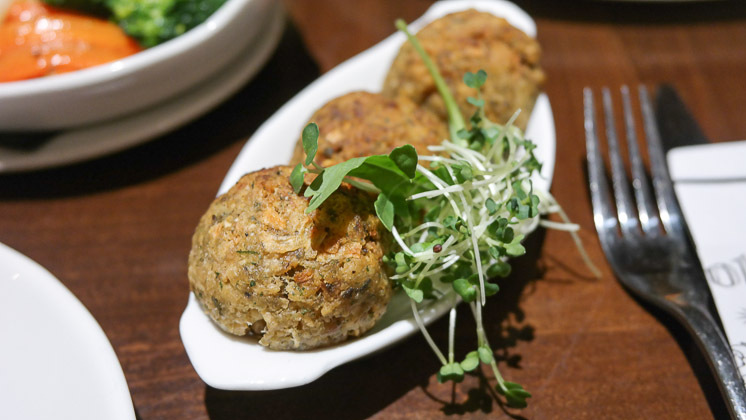 Oh, and the stuffing balls were good! Due to time constraints, we were unable to have dessert. A good venue if you have children in your party. They had baby changing facilities as well as clean and sturdy high chairs. We were given a child’s menu / activity sheet along with some crayons too. 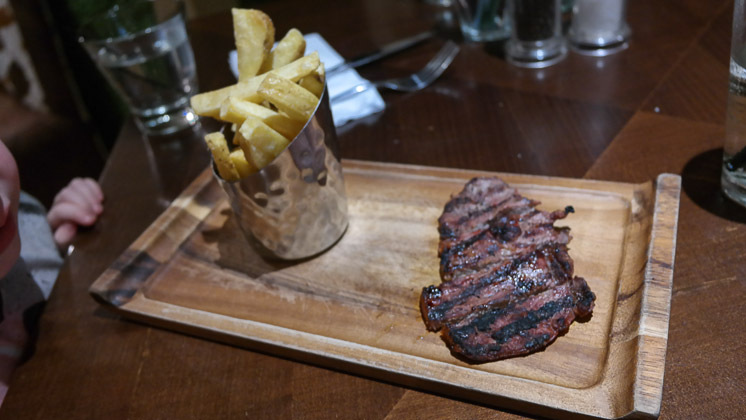 The selection of food was good – we were even able to get a child’s steak and chips! The waiters were also very good with our toddler – friendly and cheerful towards him. 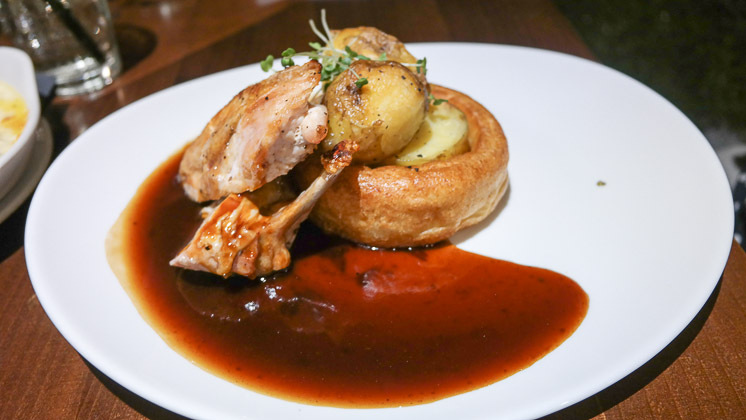 I was very pleased we booked an impromptu Sunday lunch at the Cow and Pig in Bromley. The service was good, very friendly, and the venue decor didn’t take itself too seriously – cow hide styled chairs and fake grass on the walls. The food was great, my roast beef was delicious – and I loved the fact they gave you options such as stuffing and cauliflower cheese. I would have preferred crispier roast potatoes, but they were very good with the skin on them. Also, I appreciated the selection of vegetables – nice to see a few types being served. Overall, I’d recommend for families as well as celebrations.